Study plans are extracts from the plans allowing the buyer to have a more precise knowledge of the plan content. If you are ordering the building plan, you do not need to order the study plan. The study plan is common to all rigs versions. 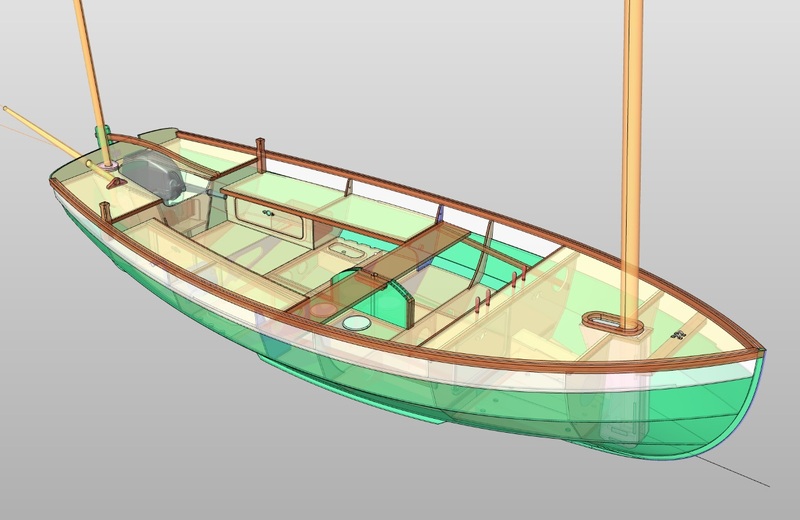 The Building plan is the basic document to build the boat. It includes a free telephone or e-mail assistance. 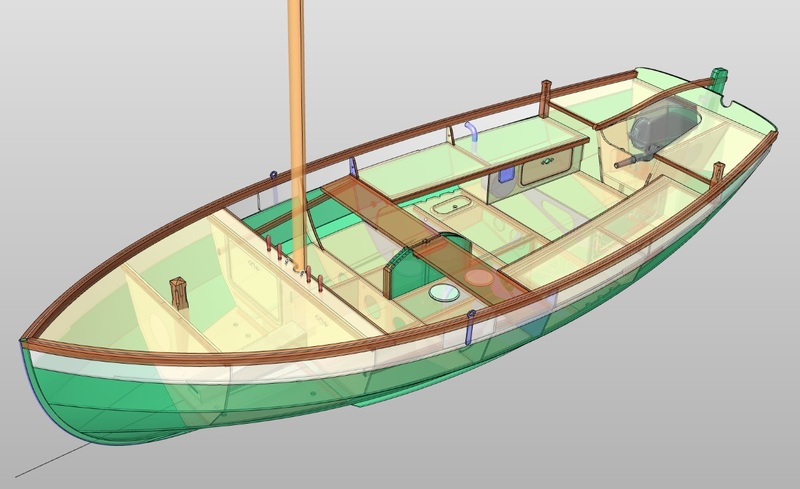 Attention: building this boat requires a numerically cut plywood kit. The kit is to be ordered from one of my partners. Postage and VAT, if applicable, are included in the shown prices. 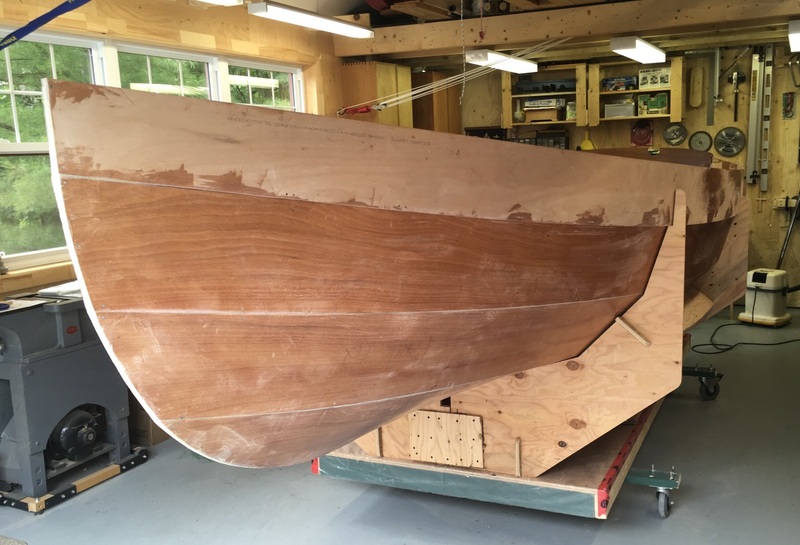 Attention: this boat may be built only with a numerically cut plywood kit. The kit may be bought from one of my partners. It is also possible to buy the CNC cutting files and have the kit cut by a local company. I intend to make available in the future full-size patterns. 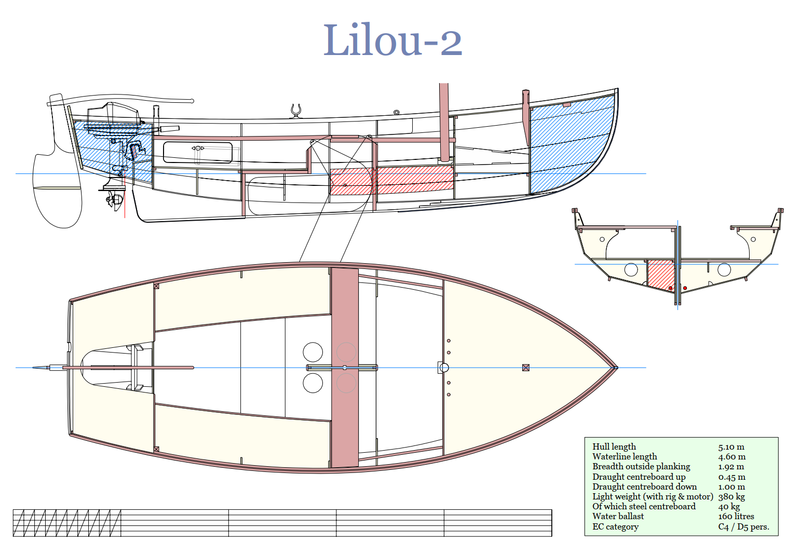 The plan of Lilou 2 is available in the French language. I am ready to translate it into English in case of an order by an English speaking customer. Lilou 2 is a revisited version of Lilou, the initial plan dating from 2005. 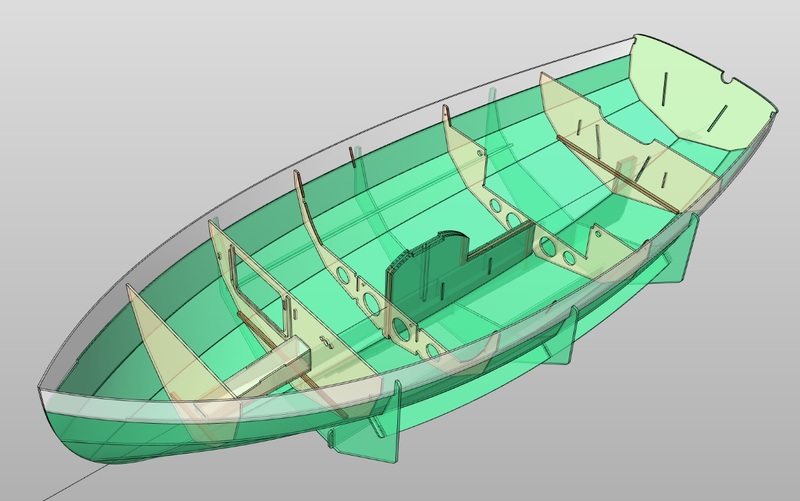 The purpose of this re-design was on the one hand to improve the characteristics of the boat, especially with hull lines ensuring better stability, a water ballast to improve seaworthiness and have a light boat on the trailer, a self-draining cockpit at the mooring. In addition, the plan was realized in 3D with a modern software allowing to illustrate the building instructions with many perspective views and make the construction more straightforward. 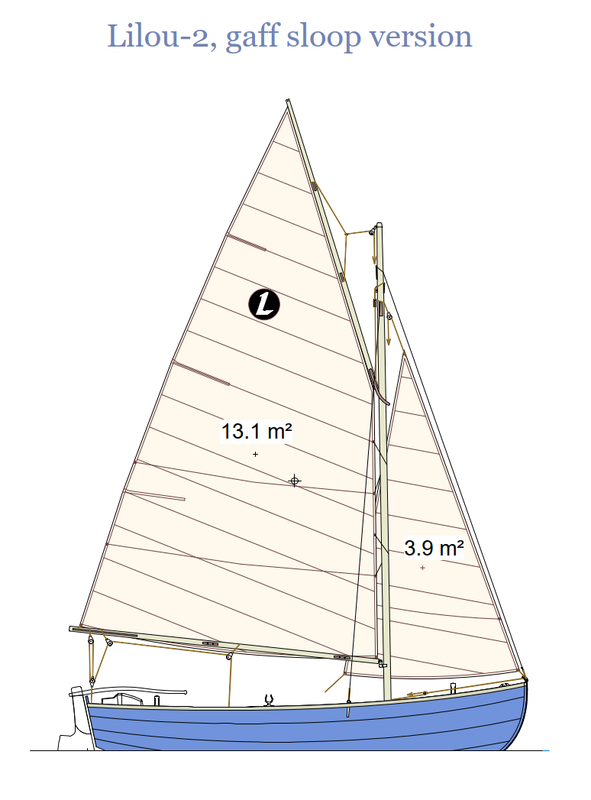 Two main sail rigs are possible: the gaff sloop, giving good performance, in particular to windward, and a lug yawl. 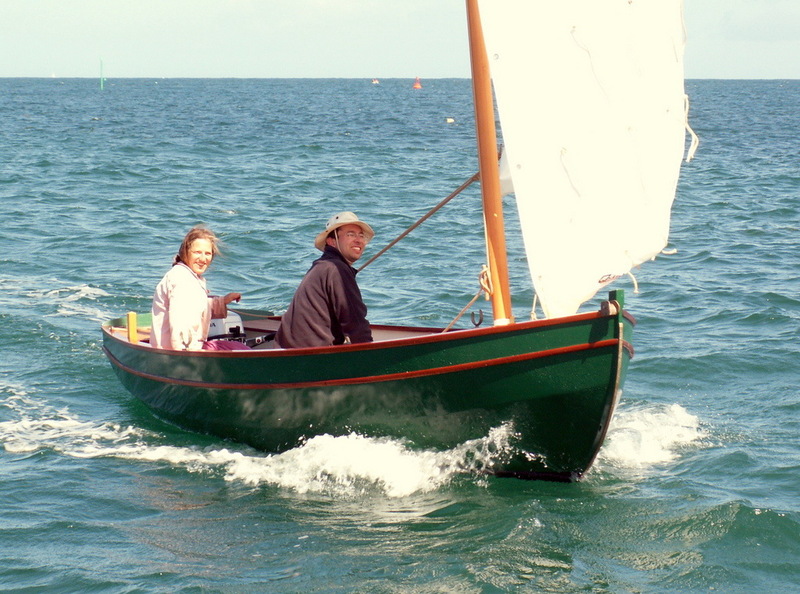 This last rig is mostly suitable for fishing or family sailing. 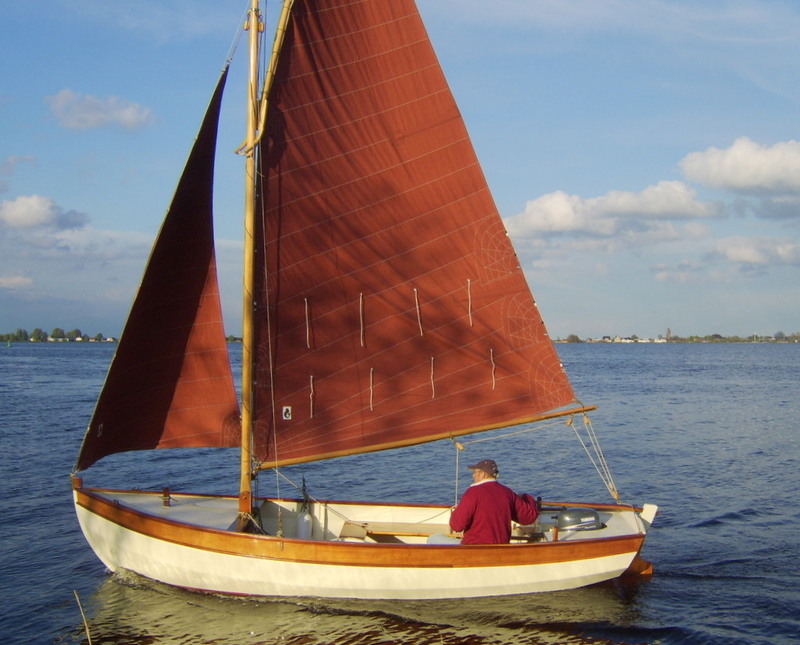 There is no boom and the mizzen sail reduces rolling when moored or motoring. 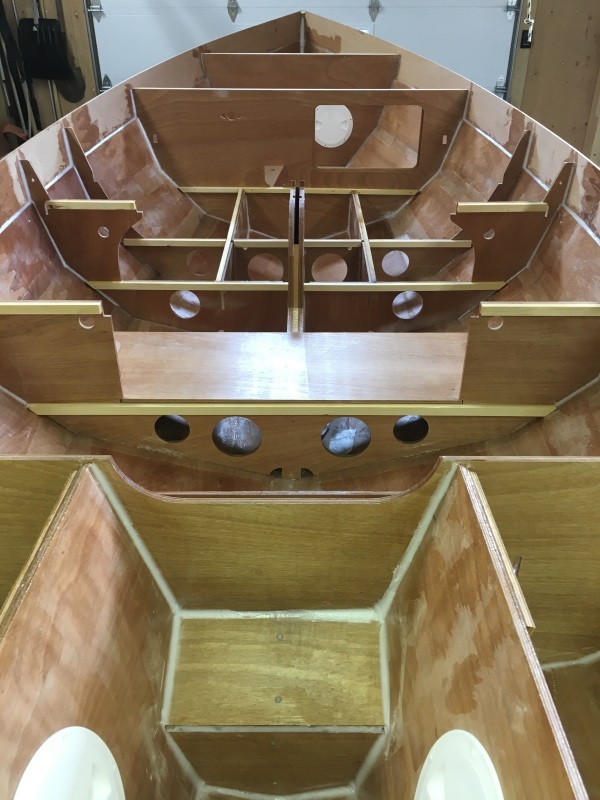 The transom rake has been reduced to allow the installation of the mizzen mast. 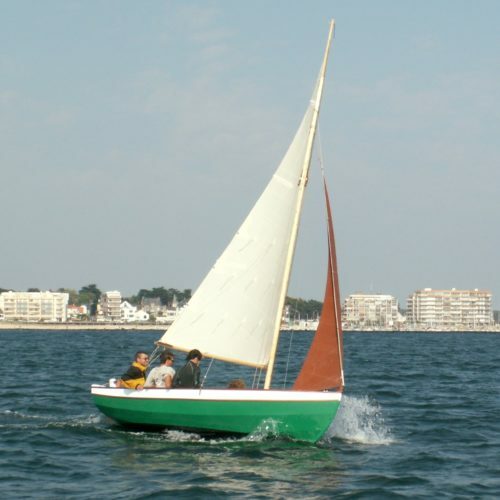 Be a daysailer inspired by the tradition, seaworthy, stable, suited to family sailing and fishing under sail or motor. Have good performance, thanks to a steel centreboard which gives stability and windward ability. Using modern wood-epoxy building technique, using the stitch and tape method for easy construction by a home builder. 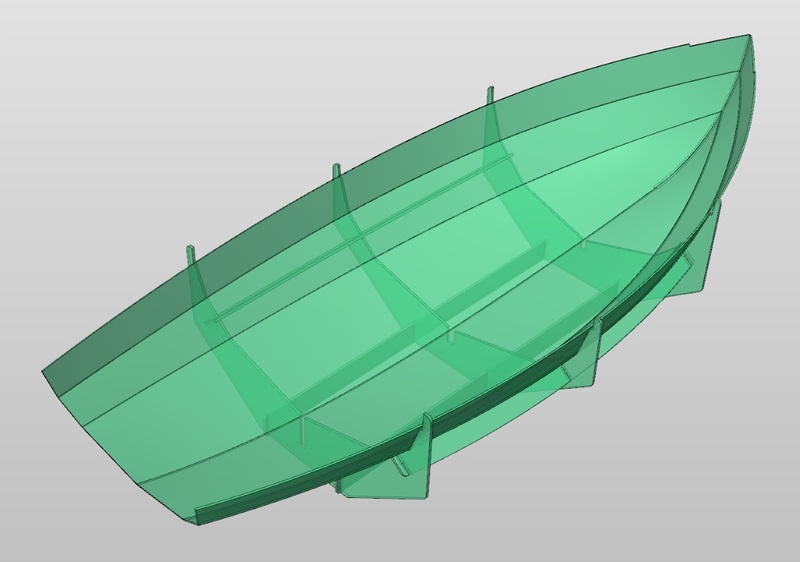 Benefit from a fully epoxy sheathed hull, resistant to shocks and abrasion, very durable (no risk of osmosis) and easy to maintain. 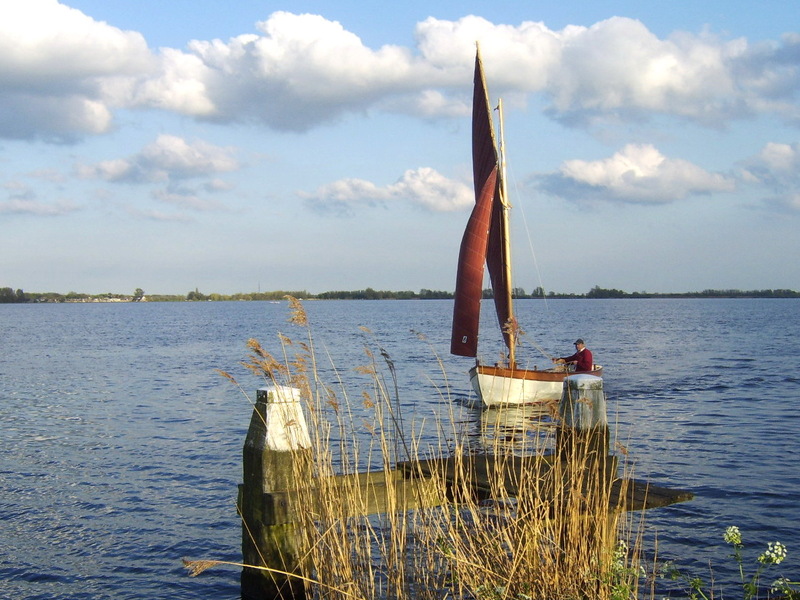 Able to receive an outboard into a well, at easy helmsman reach (2.5 to 5 hp). Trailerable and easy to launch and recover. Short enough (5.1 m, less than 17′) to be built and stored into a common size garage. Compared to Ebihen 16, having a similar use, Lilou 2 is much more simple to build and more economical. 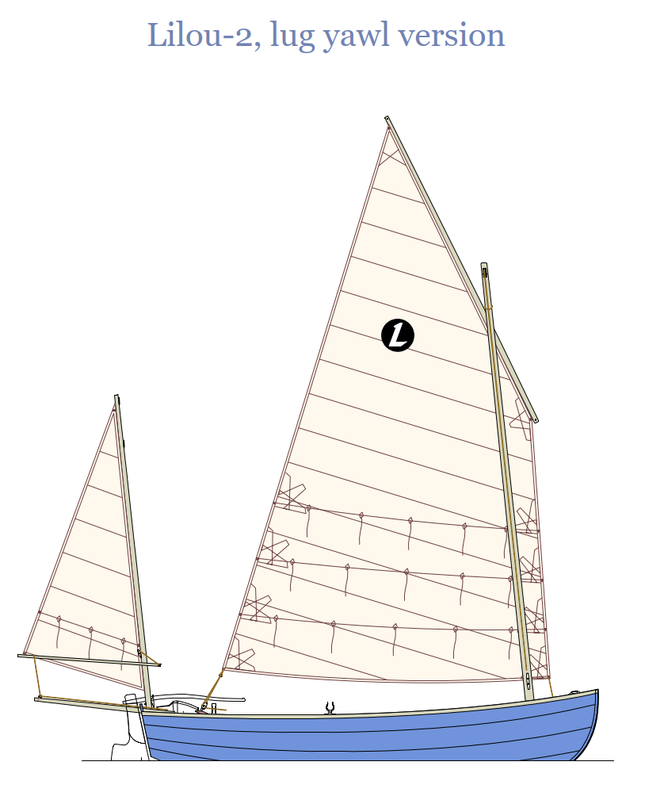 Lilou 1 lug sail version. On Lilou 2, the transom has less rake in order to step the mizzen mast. Be the first to review “Lilou 2” Click here to cancel reply.